Exporting has been part of the business plan at Hernon Manufacturing, a custom formulator of adhesives, sealants, and precision dispensing and curing systems, since 1999. The company’s president, Harry Arnon, believed there was unrealized potential in international markets, however, and recently decided to refocus company efforts and make exporting a top priority for Hernon’s growth strategy. To find and effectively enter the right foreign markets, Mr. Arnon turned to the Small Business Development Center at UCF for assistance with an aggressive international growth strategy, and was matched with an opportunity to participate in the Export Marketing Plan Services, which had launched in September 2011, due in large part to the State Trade and Export Promotion (STEP) grant that was awarded to Enterprise Florida, Inc. by the U.S. Small Business Administration. Enterprise Florida partnered with the SBDC at UCF to offer customized export marketing plans to Florida manufacturers and professional service providers. After meeting with SBDC at UCF’s International Trade Specialist, Nerine Elattar, planning commenced immediately, and soon after the export marketing plan was delivered to Mr. Arnon. 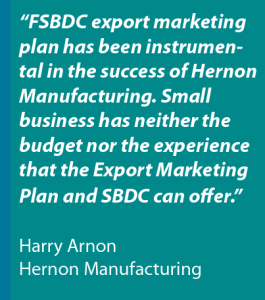 The plan provided the full gamut of necessary information for successful international market entry: a thorough export readiness assessment, an industry analysis, a market analysis with target market recommendations for Hernon’s products, a review of overseas trade opportunities, and an action plan.“FSBDC export marketing plan has been instrumental in the success of Hernon Manufacturing. Small business has neither the budget nor the experience that the Export Marketing Plan and SBDC can offer. For Hernon Manufacturing the export marketing plan laid out the road map translating in best return on investment concentrating where more business potential is available for our products,” commented Mr. Arnon. Along with the plan, the company was eligible to receive a grant for a single standalone Gold Key with the U.S. Commercial Service. The company decided to utilize the Gold Key in Italy and also added France, two recommended markets from the plan, and in early 2013 traveled to those countries for one-on-one meetings with pre-screened, qualified buyers. The company reported $1.37 million in export sales worldwide as a result of the Gold Key Matching Service. “The Gold Key offered us opportunities that would not otherwise materialize for Hernon Manufacturing Inc. We would not have participated without the grant. We met with 2 companies in France and 6 companies in Italy. The consulates were immensely helpful in selecting suitable companies that match up well with us and with setting up appointments and simple translation services. Sales in these 2 countries can increase our production staff significantly,” commented Mr. Arnon. Hernon anticipates total export sales through the next 24 months to be $3.226 million. Hernon’s products are now found in over 27 countries worldwide and the company has been recognized for its exporting efforts, most recently winning the 2013 SBA Small Business Exporter of the Year Award and the 2012 Exporter of the Year award by ThinkGlobal, Inc. Mr. Arnon looks forward to continuing to work with the SBDC at UCF to further expand internationally. For more information on the SBDC at UCF’s Export Marketing Plan Services, visit www.sbdcorlando.com/exportmarketing.